You’ve heard it before. A picture is worth a thousand words (Confucius, Fred Barnard). That’s why I present this illustration. There is a book that I really like written by Kenneth Wanberg and Harvey Milkman showing an illustration depicting the same concept. The image looks like an electrical diagram. While it is totally accurate it can be confusing and intimidating to some folks. Clients told me that this illustration makes much more sense to them. Others have said the same thing. To me this picture explains the Cognitive Behavior Theory process as well as the ABC Theory of Albert Ellis. On page 14 of my book I describe the ABC Theory. Simply, Ellis said that “it is not the event (A) that determines our behavior (C) but rather our (B) beliefs about the event. So, we have(A) the event followed by (B) our beliefs about the event that lead to (C) our behavior. Thus, ABC. While we are here we can examine what the map is saying. The event occurs and we filter the meaning of the event based on our beliefs, values and attitudes. We are exposed to millions of bits of information on a daily basis. Our brain knows that we cannot process all of these pieces of data. So the data are filtered.We delete, distort and generalize the information based on our ‘imprints’. Imprints are critical when it comes to understanding old behavior and learning new behavior. This includes using alcohol and other drugs (AOD) and criminal thinking and conduct (CTC). Konrad Lorenz is given credit here for this theory. He discovered baby geese will bond with the first image they see after birth as if it were their mother. In his case the goslings bonded with his boots and followed him around like he was the mother, if I have the story correct. He postulated that these imprints are permanent.Why is this important to mention here? Our history or learning has everything to do with how we interpret and define ourselves and our world. So often it is past events that limit us in the present or prevent having our desired outcomes or futures. Imprints can occur at the molecular level, the psychological level and the social level. So, we and our behaviors truly are biopsychosocial in nature. As we filter data we turn it into a thought stack made up of decisions, attributions, appraisals and expectations (follow the arrows). Don’t people use drugs or act based on their expectations of what is supposed to happen by using them? Remember? We avoid pain and seek pleasure. We then form solid internal maps of our reality based on our five senses. All of us experience our realities by seeing, hearing, feeling, smelling and tasting. If our restaurant server presents a messy plate (see) that (smells) like it is decaying already we are certain that we don’t need a taste. We (expect) it will be terrible. We (feel ) bad enough already. Our self-talk (hear) says no – don’t eat it. But you (taste) it anyway and send it back (if you are assertive) if it is not satisfactory. The short name for the five senses is VAKOG. This is visual, auditory, kinesthetic, olfactory and gustatory. More generally they are see, hear, feel, smell and taste. These lead directly to the next step which is feelings and emotions. As you can see by the flow (following the arrows) feelings and emotions lead to behavior choices. That’s why it is important to learn how to control your state. Your emotional state is what is meant here. If you are sad you may act sad. If you are angry you may act or react in an angry manner. Could that be important in homes where domestic violence may be a problem? Seldom is a spouse happy and giggly and then turns around and backhands the other. We can learn to map the outcomes that are more desirable. We have the power and resources already. We simply need access to them at the appropriate time. This will be demonstrated below. This was a powerful lesson taught by Carl Rogers. He is a world famous therapist. To paraphrase him, “clients already have all the resources they need to explore and resolve their own issues given a healthy environment.” Hopefully, I as a guide would provide the healthy environment, online or in person. What’s the take home message? 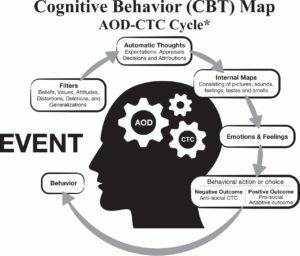 Between the CBT Map above and the lessons taught to us by Albert Ellis and Carl Rogers there is HOPE for all of us. We are in charge of shaping our beliefs, thoughts, feelings and behavior. We can re-imprint our history mentioned my Konrad Lorenz? The map above is your operating system. It applies to each one of us. Nobody, not the neediest narcissist – is immune to that fact of life. Learn the map, how you and it are connected and you will discover that you are in charge of how you feel and your future. We examine ‘how to’ do that in the next post.